Which Offers a View that’s Upto 17% Bigger As Well as a Screen Ratio of 88.8% Aspect ratio. Realme 2 has 4230 mAh battery which comes with an AI which suspends or gives low power to inactive apps, this gives a longer battery life like up to 10 hours of heavy gaming & 15 hours of video playback time on a single full charge. 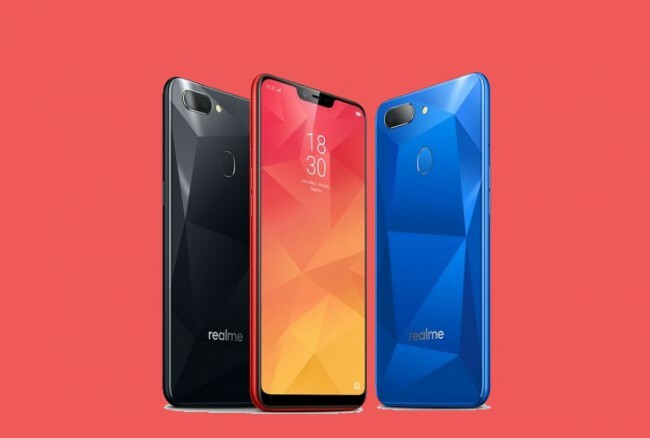 And talking about its design again Realme put a diamond cutting Design at the back of the Smartphone and it is 12 layers of nanoscale composite material on the its body, also with this modish design it has glossy finish at the back which also reflects light making this phone a Head turner! Talking about its Camera it has Dual Camera setup at the back with Portrait mode enabled, this Camera can click attractive shots with phone’s 13 MP + 2 MP dual rear camera system. It has 8 MP Front camera which uses AI to analyse multiple facial traits. It also has the AI Beauty 2.0 Selfie Technology with up to 8 million beautification options to let us capture the most flattering selfies. Now this Smartphone is powered by Qualcomm Snapdragon 450 Octa-core CPU, It speeds up graphic rendering by up to 25% and its CPU is quite Power efficient ,it lowers the phone’s power consumption by up to 30%. It has Adreno 506 GPU with 25% Enhanced Performance. For Phone Security it has both Facial & fingerPrint Unlocking Systems which is quite Fast because of New Technologies used in this device. Realme 2 is running on the ColorOS 5.1 which is based on Android 8.1, The ColorOS enhance interaction with the Realme 2 by adding more feature in the User Interface and makes the task more intelligent and Fluidly Fast. Also there are some Sound Enhancement done the Phone so you can aspect a better sound Quality. Realme 2 alos has a Dedicated MicroSD card slot which Supports upto 256 GB. Operating System Color OS 5.1 with Android 8.1 (Oreo). Priced at 10,990 INR & and will be Sold by Flipkart.